These dinner entree recipes are packed with foods that will give you energy without making you feel too full and are perfect for leftover lunches! Crock pot Black Beans are easy to make, inexpensive, filling, and delicious. This soup cooks while you sleep! You will need a large crock pot for this recipe. Pour black beans in a glass container and completely cover them with liquid. Soak the beans overnight or 6-8 hours. Heat crock pot to low heat, add all ingredients making sure to drain and rinse the soaked black beans before adding to crock pot. 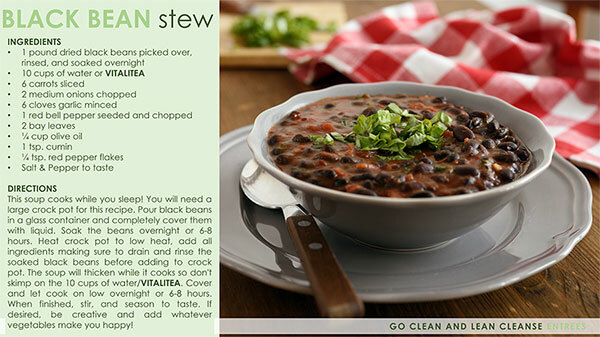 The soup will thicken while it cooks so don't skimp on the 10 cups of water/VITALITEA. Cover and let cook on low overnight or 6-8 hours. When finished, stir, and season to taste. If desired, be creative and add whatever vegetables make you happy! 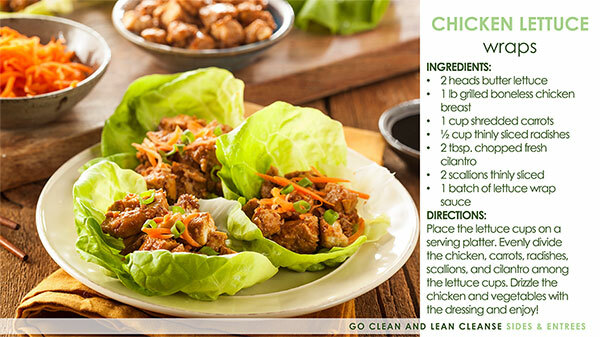 Place the lettuce cups on a serving platter. 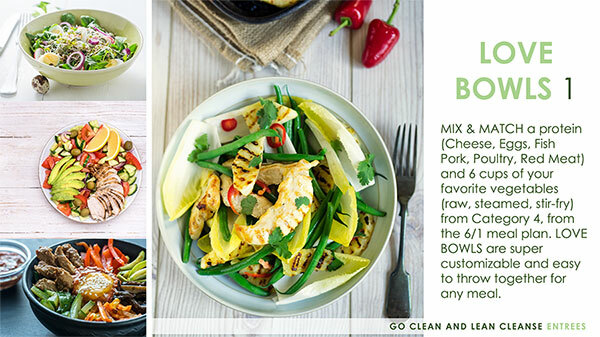 Evenly divide the chicken, carrots, radishes, scallions, and cilantro among the lettuce cups. Drizzle the chicken and vegetables with the dressing and enjoy! Sesame oil is a lesser known vegetable oil but is, in fact, one of the healthiest alternatives to normal vegetable oil options. In a blender or food processor, combine the sesame oil, lime juice, garlic, ginger, lime zest, and MIND; blend until smooth. Mix in sesame seeds. 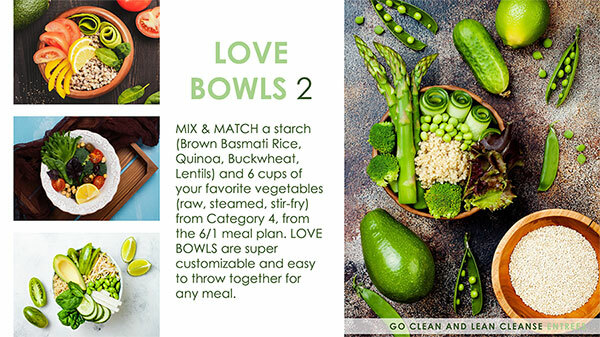 Love Bowls are any combination of protein and vegetables OR starch and vegetables. They are super customizable and easy to throw together for any meal. In a large Dutch oven over medium heat, heat 2 tbsp. of olive oil. Add the onion and garlic. Stir to coat with oil. Add the pasta, tomatoes, salt, pepper, 4 whole basil leaves, and water to the pot. Bring to a boil and cover the pot. Cook for 8-10 minutes. Check the pasta and add more water if necessary. Continue cooking until pasta is cooked. 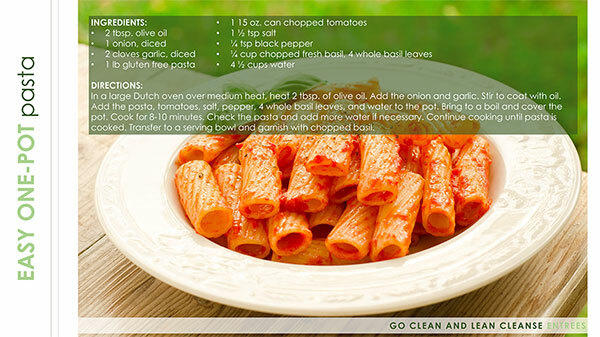 Transfer to a serving bowl and garnish with chopped basil. 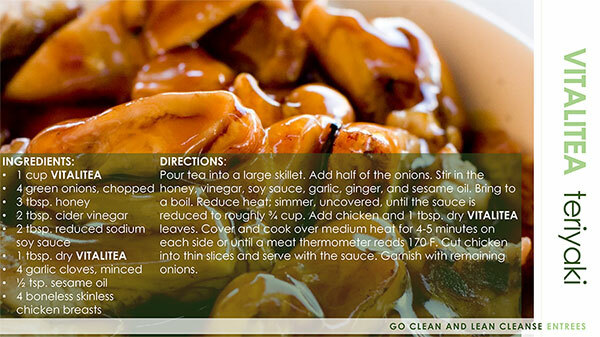 This recipe can be used with other types of meat and vegetables as well. Kabobs are simple to put together and easy for cleanup. 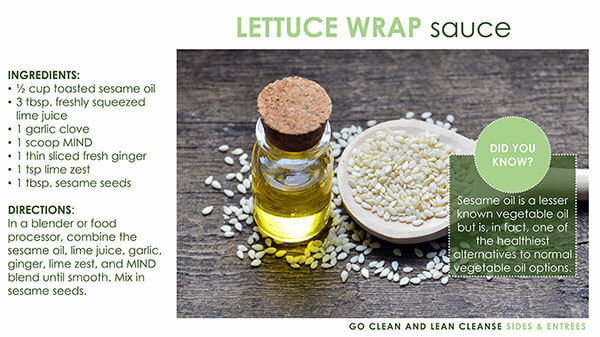 In a large resealable plastic bag, combine the oil, soy sauce, vinegar, MIND, and garlic powder. Add beef. Seal bag an turn to coat, refrigerate for at least 1 hr. Drain and discard marinade. 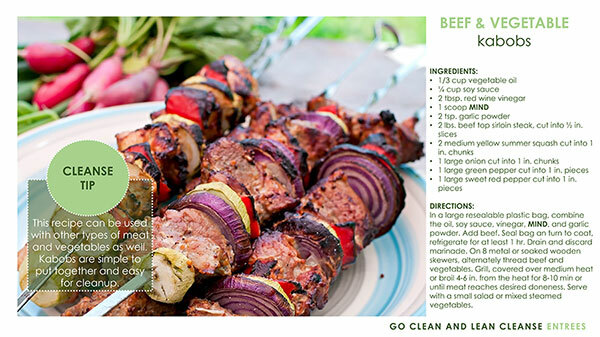 On 8 metal or soaked wooden skewers, alternately thread beef and vegetables. Grill, covered over medium heat or broil 4-6 in. from the heat for 8-10 min or until meat reaches desired doneness. Serve with a small salad or mixed steamed vegetables. 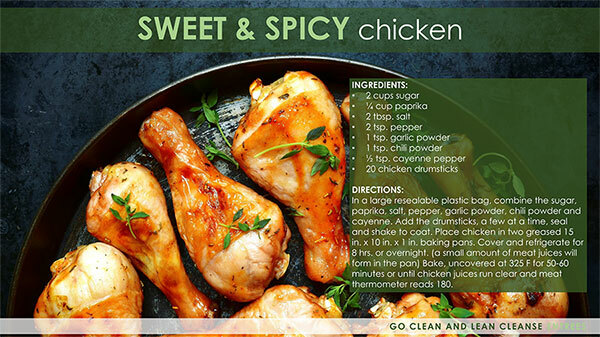 In a large resealable plastic bag, combine the sugar, paprika, salt, pepper, garlic powder, chili powder and cayenne. Add the drumsticks, a few at a time, seal and shake to coat. Place chicken in two greased 15 in. x 10 in. x 1 in. baking pans. Cover and refrigerate for 8 hrs. or overnight. (a small amount of meat juices will form in the pan) Bake, uncovered at 325 F for 50-60 minutes or until chicken juices run clear and meat thermometer reads 180. 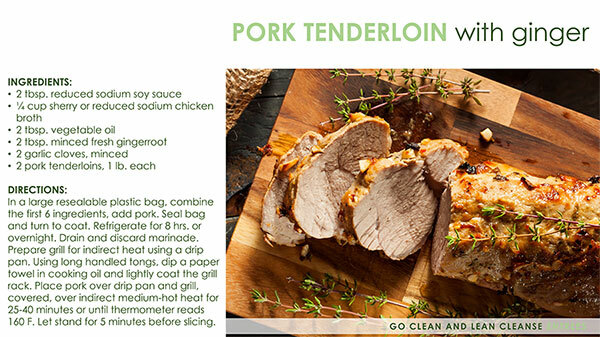 In a large resealable plastic bag, combine the first 6 ingredients, add pork. Seal bag and turn to coat. Refrigerate for 8 hrs. or overnight. Drain and discard marinade. Prepare grill for indirect heat using a drip pan. Using long handled tongs, dip a paper towel in cooking oil and lightly coat the grill rack. Place pork over drip pan and grill, covered, over indirect medium-hot heat for 25-40 minutes or until thermometer reads 160 F. Let stand for 5 minutes before slicing. In a small saucepan, combine the orange juice, syrup, vinegar, mustard, ½ tsp. salt and ¼ tsp. pepper. Bring to a boil, cook until liquid is reduced to ½ cup, for about 5 min. Stir in basil and arrange peel. Remove from heat and set aside. Sprinkle chicken with remaining salt and pepper. 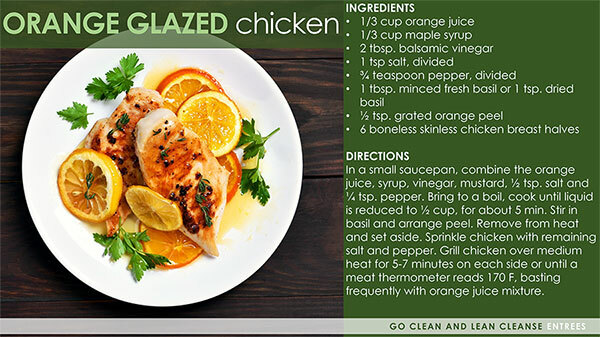 Grill chicken over medium heat for 5-7 minutes on each side or until a meat thermometer reads 170 F, basting frequently with orange juice mixture. Pour tea into a large skillet. Add half of the onions. Stir in the honey, vinegar, soy sauce, garlic, ginger, and sesame oil. Bring to a boil. Reduce heat; simmer, uncovered, until the sauce is reduced to roughly ¾ cup. Add chicken and 1 tbsp. dry VITALITEA leaves. Cover and cook over medium heat for 4-5 minutes on each side or until a meat thermometer reads 170 F. Cut chicken into thin slices and serve with the sauce. Garnish with remaining onions. Sprinkle chicken with salt and pepper. 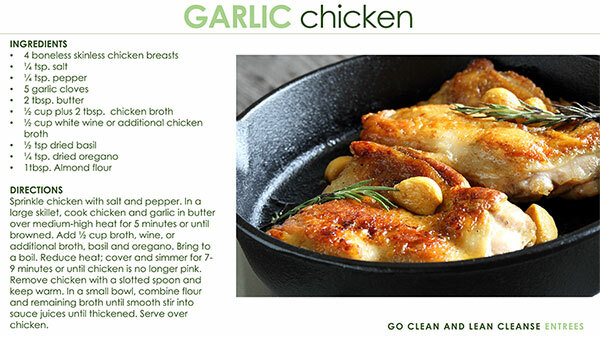 In a large skillet, cook chicken and garlic in butter over medium-high heat for 5 minutes or until browned. Add ½ cup broth, wine, or additional broth, basil and oregano. Bring to a boil. Reduce heat; cover and simmer for 7-9 minutes or until chicken is no longer pink. Remove chicken with a slotted spoon and keep warm. In a small bowl, combine flour and remaining broth until smooth stir into sauce juices until thickened. Serve over chicken. 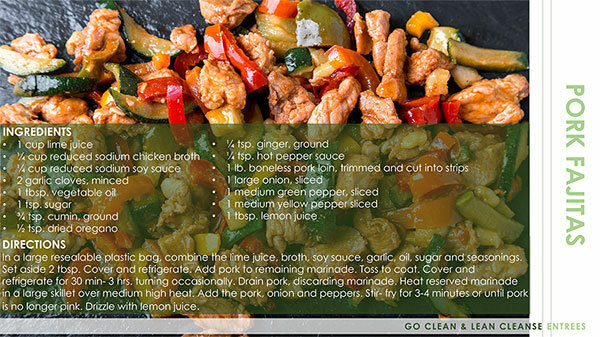 In a large resealable plastic bag, combine the lime juice, broth, soy sauce, garlic, oil, sugar and seasonings. Set aside 2 tbsp. Cover and refrigerate. Add pork to remaining marinade. Toss to coat. Cover and refrigerate for 30 min- 3 hrs. turning occasionally. Drain pork, discarding marinade. Heat reserved marinade in a large skillet over medium high heat. Add the pork, onion and peppers. Stir- fry for 3-4 minutes or until pork is no longer pink. Drizzle with lemon juice. 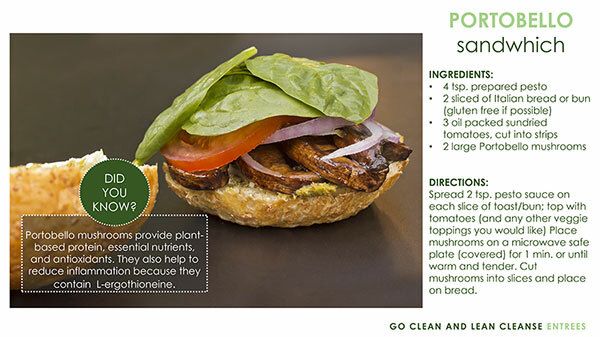 Portobello mushrooms provide plant-based protein, essential nutrients, and antioxidants. They also help to reduce inflammation because they contain L-ergothioneine. Spread 2 tsp. pesto sauce on each slice of toast/bun; top with tomatoes (and any other veggie toppings you would like) Place mushrooms on a microwave safe plate (covered) for 1 min. or until warm and tender. Cut mushrooms into slices and place on bread. 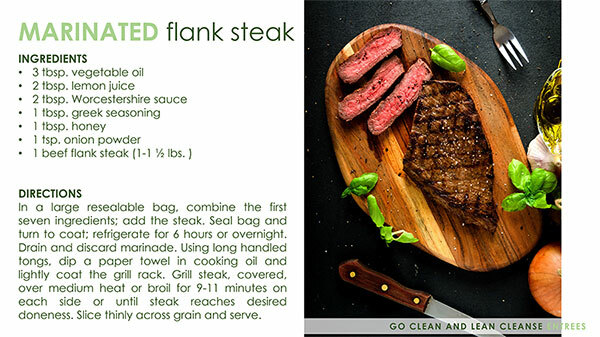 In a large resealable bag, combine the first seven ingredients; add the steak. Seal bag and turn to coat; refrigerate for 6 hours or overnight. Drain and discard marinade. Using long handled tongs, dip a paper towel in cooking oil and lightly coat the grill rack. Grill steak, covered, over medium heat or broil for 9-11 minutes on each side or until steak reaches desired doneness. Slice thinly across grain and serve. 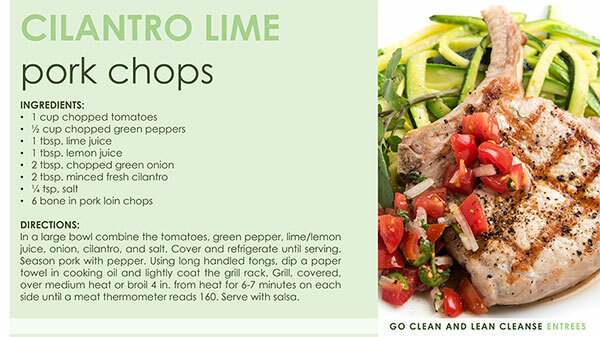 In a large bowl combine the tomatoes, green pepper, lime/lemon juice, onion, cilantro, and salt. Cover and refrigerate until serving. Season pork with pepper. Using long handled tongs, dip a paper towel in cooking oil and lightly coat the grill rack. Grill, covered, over medium heat or broil 4 in. from heat for 6-7 minutes on each side until a meat thermometer reads 160. Serve with salsa.